Although the second day of a barbecue fundraiser for the Chinook Arch Victims Services Society in Sundre had to be cancelled because of the weather, organizers were pleased with the turnout on the first day. “It was good — it’s been a long time since we did a barbecue,” said Rhonda Kearns, program manager for the society. 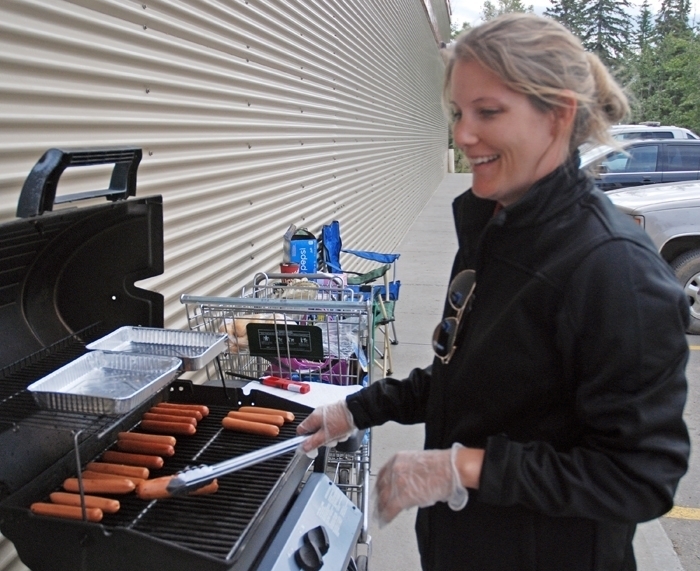 The event was held at the Sundre IGA parking lot on Thursday, Aug. 20. Cold, rainy weather prompted organizers to cancel their plans to return the following day. About $350 was raised, and once expenses were accounted for, there was about $280 left, said Donna Murphy, the Sundre coordinator for Chinook Arch Victims Services. Organizers had hoped to raise about $500, and likely would have had it not been for the bad weather. “Friday would have been better, but the weather wasn’t in our favour,” she said, adding that another barbecue fundraiser will be held in Sundre in the spring. The society provides services throughout Mountain View County and is made up of volunteers who work under guidance and direction of police. Services are free and confidential. “We’re there to make sure victims have a voice,” said Kearns, adding victims services provides a support network for victims of crime as well as people who have suffered a traumatic experience. Volunteers, who are also known as advocates, help people through the court process as well. The organization has been around since the late 1990s, and currently has 13 advocates, she said. “They can’t be acknowledged enough for what they do,” said the Sundre RCMP detachment’s Sgt. Jim Lank, who attended the barbecue. It wasn’t all that long ago that there was no such service for victims of crime or trauma, he said. “They provide such a valuable service. They’re a real asset to front line officers” who might not always be able to follow up with victims, he said. Volunteers commit their time at all hours to help people, and they do it without expecting thanks, he said.